I'm not terribly in touch with my Polish heritage, so when I get an offer to review an Easter picture book with a description that includes "a Polish folktale," I simply have no choice but to check into it. 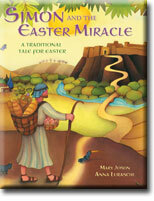 Simon and the Easter Miracle, by Mary Joslin, would be the book in question. From the Publisher: The gospels tell of Simon of Cyrene--"a man coming in from the country"--who was ordered to carry Jesus' cross. Over the centuries, his story has been woven into a Polish folktale. In the tradition of "The Three Trees," this folk tale gives a fresh perspective on the Easter story. When Simon the farmer brings his wares to market, little does he expect how he will be involved in the events of that very special day, nor how his items--bread, eggs, and wine--will become important symbols of Jesus' passion and resurrection, remembered throughout the ages. What struck me immediately upon receiving this book were the captivating illustrations by Anna Luraschi. There is so much detail in them. My youngest kids (6 and 8) have spent hours poring over the pictures and examining all the details. The story initially struck me as a bit weird, but re-reading the book description, and reading the story a couple more times, and now I do think it is sweet. It did give me a chance to talk about folk tales in general, and more particularly about folk tales involving real people. This is an enjoyable addition to our Easter traditions.